Nobel Prize-winning author Doris Lessing, 94, died November 17, 2013 in London. Lessing is best known for her mainstream fiction, but she wrote many books of SF, most notably the Canopus in Argos: Archives sequence: Re: Colonised Planet 5, Shikasta (1979), The Marriages Between Zones Three, Four, and Five (1980), The Sirian Experiments (1981), The Making of the Representative for Planet 8 (1982), and Documents Relating to the Sentimental Agents in the Volyen Empire (1983). Other works of genre interest include Briefing for a Descent into Hell (1971), The Summer Before the Dark (1973), The Memoirs of a Survivor (1974), The Fifth Child (1988) and sequel Ben, in the World (2000), The Cleft (2007), and Alfred and Emily (2008). The Mara and Dann series is postapocalyptic SF: Mara and Dann: An Adventure (1999) and The Story of General Dann and Mara’s Daughter, Griot and the Snow Dog (2005). Among numerous other awards, Lessing received the Nobel Prize for Literature in 2007, with the committee calling her “the epicist of the female experience, who with skepticism, fire and visionary power has subjected a divided civilization to scrutiny.” She famously replied, “Oh Christ! I couldn’t care less,” when informed of the Nobel win. She was guest of honor at Worldcon in 1987, and at ICFA in 1989. Doris May Taylor was born October 22, 1919 in Kermansha Persia (now Iran), and lived briefly in England before moving to Southern Rhodesia (now Zimbabwe) in 1924. Her first novel The Grass is Singing appeared in 1950, followed by the Children of Violence series: Martha Quest (1952), A Proper Marriage (1954), A Ripple from the Storm (1958), Landlocked (1956), and The Four-Gated City (1969); the final volume moves into near-future SF territory. She became famous for her masterpiece The Golden Notebook (1962), which many found scandalous for its frank discussions of women’s issues and sexuality. In all, she wrote more than 50 novels, as well as numerous story collections, plays, non-fiction, and a book of poetry. She is survived by a daughter and two granddaughters. 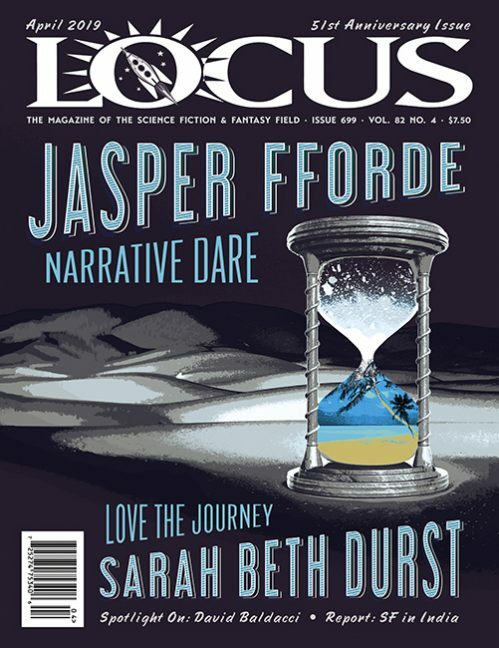 See the December issue of Locus for a complete obituary. For more, see Lessing’s entry in the Encyclopedia of Science Fiction.